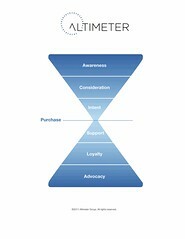 Left: The Customer Hourglass looks at the entire customer experience –beyond the marketing funnel. Today, 82% of marketing departments have formalized social media programs, and are just spreading to other business units such as 30% of customer support and a mere 16% of product teams have formalized programs, read the data to learn more. Yet, in our research of the corporate social strategist, we found that their desire to span across multiple business units was a career goal. Segmented primarily into marketing, social media programs must extend across the entire customer lifecycle. To visualize how this change will occur, it’s best to follow a customer framework, rather than gear this by departmental silos. The Customer Hourglass combines both the traditional marketing funnel, and replicates it, extending to support, loyalty and innovation. While your specific hourglass may have specific needs for your B2B and B2C market, we designed this one to meet a common customer engagement. Watch the video of a recorded webinar with Allegiance (an Altimeter client) below to see real world examples of how companies are applying these concepts today.